Each year, we ask our members to recommend colleagues who have made particularly important contributions to our cause as board members and as an association. Selecting a Board Member of the Year is difficult because we must pick from among very deserving individuals who come from very different colleges and boards, and from very different backgrounds and experiences. We were honored to review the nominations for several really extraordinary members this year, and the committee would be proud to have selected any of the candidates. The Board Member of the Year Award is based on four criteria: involvement at the district level, involvement at the state level, involvement at the national level, and the individual’s overall service through other contributions. Betty Bruski Mallek’s leadership of Mid-State Technical College and the Wisconsin Technical College mission is a legacy in the making. Her continuous service on the Board since 1990 has seen us through the proverbial ups and downs, yes. But the way she has helped Mid-State manage those transitions is why we nominate her for the 2019 WTCDBA Board Member of the Year—always with an open mind and a bold vision of the good that lies on the other side of even the most challenging obstacles. Betty maintains deep ties to central Wisconsin’s communities. Employed by the City of Stevens Point since 1975, she also co-owns a dairy farm with husband Peter in the Village of Junction City, served for 10 years as a volunteer firefighter and EMS first responder for the Village of Junction City, and is a member and convention delegate of FarmFirst Dairy Cooperative. 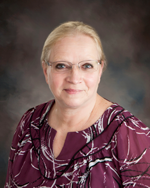 She has served as district director of the Wisconsin Municipal Clerks Association (WMCA) and secretary of the Executive Committee of the Board of Directors. Looking to give back even more, 27 years ago Betty began her incredible run of service on the Mid- State Board. In that time, she has acted as secretary (11 years), treasurer (two years), and chair (four years). She is a constant presence at college-wide events and regularly speaks at Mid-State’s commencement ceremonies. Yet Mid-State has come to rely on far more than Betty’s presence at College functions. Betty’s influence is profound because it is characterized by innovation built on the trust she has earned through long experience and tireless dedication to the College. As liaison to the Mid-State Foundation since 2012, she has actively pursued professional development that brings visionary new ideas to the College. One such idea led her to create a closer relationship between the Foundation and the Board, and she supported the resulting initiatives with the resources needed to achieve results. As Board chair she also facilitated the 2016–17 search for a new College president and created a comprehensive plan for a positive first-year experience. This included frequent meetings with new president Dr. Shelly Mondeik, supporting a year-long listening tour personally connecting Dr. Mondeik to each employee, inviting Dr. Mondeik to WTCDBA quarterly meetings, and creating ongoing opportunities to introduce Dr. Mondeik to people and businesses in the community. The roots of Mid-State’s successes are often found in Betty’s vision to pursue a bold project and provide the resources to see it through. Her ongoing and vocal support of facility renovations has enabled the College to attract and retain students and ensure their preparation for today’s workforce. Betty also led comprehensive student technology upgrades—called “The Connected Experience”—and championed transforming the College’s library and Learning Commons areas into the LiNK, hi-tech spaces for learning and collaboration across all campuses. She has been wholly supportive of our new Workforce & Economic Development division, formed in fall 2017 to expand Mid-State’s role in addressing the skilled labor shortage and helping existing employees grow through additional training. Her leadership behind Wisconsin Farm Technology Days, in Wood County this summer, helped us to deliver 13 exciting hands-on program exhibits to the 42,000 people in attendance, sparking many inquiries and meaningful connections with industry partners. An active member and leader of the District Boards Association, with 100-percent attendance at those meetings in recent years, Betty was elected secretary treasurer last year. In her new role, she has already contributed to the annual planning session that created a new two-committee structure. Betty has also continuously worked to build and maintain relationships with state legislators and regularly attends Wisconsin Towns Association meetings in Portage County. At the national level she has attended nine ACCT Leadership Congress conferences and many more ACCT National Legislative Summits to increase awareness of Mid-State and support lobbying efforts focused on securing funding and local control for the College. Mid-State’s Board of Directors considers Betty’s resilient, positive, and consistent leadership a gift that keeps the College evolving to meet the needs of students and ensures we are a valued resource to our communities. We are grateful that she continues to serve with a passion for higher education and a vision for turning challenges into opportunities.